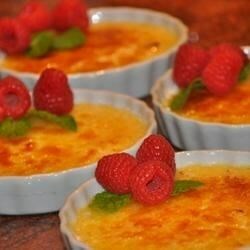 "I had this wonderful dessert on vacation and have since played around with a basic Creme Brulee recipe until I came up with this little bit of heaven!" Set 6 (4-ounce) ramekins in a deep baking dish. Put 1 tablespoon of the macadamia nuts into each of the ramekins. In a saucepan, stir the cream and sugar over medium heat. When the mixture comes to a slow simmer, add the white chocolate and remove from the heat. Whisk until the chocolate has completely melted. Stir in the egg yolks, one at a time, continuing to whisk until combined. Stir in the vanilla extract. Divide the mixture evenly between the ramekins. Place the dish into the oven and then pour water into baking dish until ramekins are 3/4 submerged. Bake in preheated oven until custard has set, about 45 minutes. Remove pan and turn oven to broil. Sprinkle the brown sugar over each of the ramekins. Place pan under broiler until sugar has melted and caramelized, about 5 minutes. Remove ramekins from water bath. Allow to cool for about 15 minutes. I prefer to chill these in the fridge before serving however they are just as heavenly served warm. If only this was zero calories... No matter. Make this and grab a TABLESPOON to eat it with. Macadamia nuts are great in this recipe. I made it for Easter dessert and will be making it for Christmas. It was my first time making creme brulee and it turned out perfect. A great recipe! VERY GOOD! the only change i made was white sugar on top, and raspberries/ mint leaves to garnish on top! I was nervous about making my first creme brulee, but it was so easy and it turned out great !! My only suggestion is to use 1 teaspoon instead of the brown sugar.